'Climate financing' has been a buzzword ever since the international community decided on a shift in investment towards low carbon, climate resilient options to limit global warming to 2˚C in the coming century. Developed countries have committed to mobilise $100 billion per year by 2020 to enable poor countries for two new buzzwords: mitigation and adaptation. Mitigation is any action taken to permanently eliminate or reduce the long term effects of climate change, while adaptation is the ability of a system to adjust and cope with climate change. The Rio+20 Summit this week in Brazil is deliberating on the renewal of political commitment and promotion of a global green economy. A country like Nepal will need to clearly define how a green economy will fulfill its development goals. As an agrarian economy, our concern should be to leverage Nepal's position as a least-polluting nation to mitigate potential future environment degradation. Nepal's focus will be more towards sustainability and adaptation of mountainous countries to climate variability, and how to increase international competitiveness to access available financial resources. We need to ensure that climate finance is used to catalyse and scale up public and private sector investment needed to address climate change, and promote Nepal as an environmentally-friendly economy. Nepal is the only country selected to participate in two Climate Investment Fund (CIF) Pilot Programs: the scaling up of Renewable Energy Program (SREP) and Pilot Program for Climate Resilience (PPCR). Both involve joint design and implementation by the ADB (Asian Development Bank), IDA (International Development Association) and the IFC (International Finance Corporation) as well as aid agencies from the UK, Denmark, and the United States. The PPCR was approved in 2008 with a grant of $50 million and loan of $40 million towards sharing the experience and knowledge useful to designing scaled-up adaptation measures that are strategically aligned with other donor funded projects. In Nepal, donor agencies are directly working with the government, but the private sector does not have direct access to global climate funds even though it has been involved in renewable energy projects such as microhydro, biogas, solar home systems, improved water mills, energy efficiency projects and other clean and low carbon technologies. Some private sector banks and financial institutions have even supported and financed renewable energy project in rural areas. 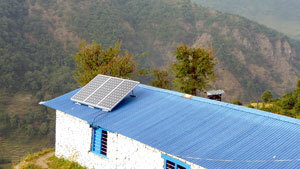 One example is the solar home system financing for rural households in Nepal in which the Ace Development Bank partnered with United Nations Environment Programme (UNEP), the Frankfurt School of Management and Winrock International to work with the Alternative Energy Promotion Centre (AEPC). The target is to install 3,500 household solar systems by the end of 2012 with the help of local cooperatives. Already, the program has saved 11,000 litres of kerosene monthly, with savings of $11,000 for households every month. It has also indirectly benefited health and the environment. This is a small step in finding alternatives to the 115 million litres of kerosene that is used every year by a quarter of Nepal's population for lighting and stoves. It is a unique example of scaling-up that cooperatives are now able to advance loans for income-generation or small and medium enterprises with available funds at a negligible default rate. The process is painstakingly slow, but the results are encouraging. If the private sector can tap into the Green Climate Fund, the multiplier effects can be replicated in many more projects involving solar or biogas. Nepal has already shown that climate micro-financing can be made endemic and deep rooted in rural areas. Siddhant Raj Pandey is CEO of Ace Development Bank and this is an excerpt from his paper at a conference on Climate Financing hosted by the Inter-American Development Bank and UNEP in Washington recently. I must appreciate the interest of private sector in climate financing. But I was wondering one thing. In third last paragraph, it has been mentioned that there is saving of $11,000 for households every month because of solar home system program but I doubt the figures. How is that huge amount possible? @Prabin Rokaya's. It is the savings that 25000 households make every month by opting out of kerosene and using SHS. This is in an incremental basis and more the subscribers more the savings. I too appreciate the private sectors for their efforts to promote clean energy. Many I/NGOs are also providing financial supports to the rural households for the installation of solar systems, micro-hydro plants and the other activities. It would be better and more fruitful if I/NGOs and the private banks joined their hands together for providing such support to rural community. In one hand, the grants provided by the I/NGOs are becoming futile. On the other hand, the rural communities are incapable of borrowing loans from the banks for community investment activities. As an example, an investment for the micro-hydro plant by the banking sectors and the financial supports by I/NGOs for the downstream irrigation. In such case, the communities can increase agricultural production as well as they can utilize electricity for establishing small entrepreneurs so that they can repay back the banking loan easily. It is good to read the article written representing the Private Sector of Nepal. Thanks Siddhant ji for allocating time to write such an important article. The initiatives taken by Ace Development Bank in cooperation with different partners and donors is acknowledgeable in the sense that it has contributed to enhance rural saving and to have pollution free homely environment. Still I disagree on the use of loan money in climate change adaptation or mitigation by the country like Nepal. We should advocate for grant money and then its effective utilization. Regarding the access to climate finance, the channel through government would be (in my opinion) the right one; however, I think, there should be a regular interaction among government, NGOs and private sectors in such kind of initiatives as well as in the use of Money in the productive sector.